I believe that in a few cases I have been able to escape that with my Filipino titanium Timex (purchased in the middle 80s). Perhaps it’s all in my imagination but every once in a while when I stare at it in my bath I notice that the second hand stops for a bit (and I would swear it goes backwards). I am sure that the moment for me stops, too. My watch somehow stops time very much like Greek gods can mingle around people who do not notice them as they move at a different frequency of time. Smelling an English Rose, one of the last ones of the season I get this immediate impression that the scent, fades immediately but my memory goes forward (not backwards) into next year’s June when that rose will charm me again. A moment can seemingly last forever if it is a boring high school class before the lunch period. In fact my religion teacher, Brother Edwin Reggio, C.S.C. told us that it was no different for souls (not quite damned) waiting in limbo for that moment of release. Will a bell ring when the gates of limbo are opened? I cannot agree with Kundera that my nose in that late in the year rose is irrevocably forgotten. After all that is what our memory is all about. I know that I can brush my female cat’s coat, she hates it and snarls at me, and yet once the torture is over she will sit on my lap in all sweetness. Is this a Kundera moment for my Plata? Or is it a case of feline forgiveness? I don’t think that moment, or any moment that is noted, is irrevocably lost. Those good instances become laced in rosiness as time passes them by. I don’t think it has anything to do with forgetfulness but more our ability to weigh the good and the bad of the moment and simply discard the bad and keep the good. I remember being a 29-year-old professor of Spanish at the Universidad Iberoamericana in Mexico City. It was run by Jesuits and I taught foreign students, mostly American women a bit of grammar, history and literature. I was not uncommonly handsome but some of them might have thought I was at least pleasant to look at. I seemed younger than my 29 year. One of my most pleasant moments was to show up on the first day of class, early. I would sit in the back of the class. The class would think I was just another student. Then they would talk about me, mostly nice things. It was fun. It was almost my idea of being present at my funeral looking in on the proceedings from the ceiling on the congregation and the stiff in the open casket. That moment cannot be irrevocably lost. It is up front in my head and I smile every time I think about it. Of the loss I felt when my father died and when my mother died, it would seem that our body's sense of self-preservation helps us forget the anguish of those moments and helps us move forward to the new. But of late, for almost two months, we (my wife and I) have learned to cope with living for every moment without knowing what the next one will bring. 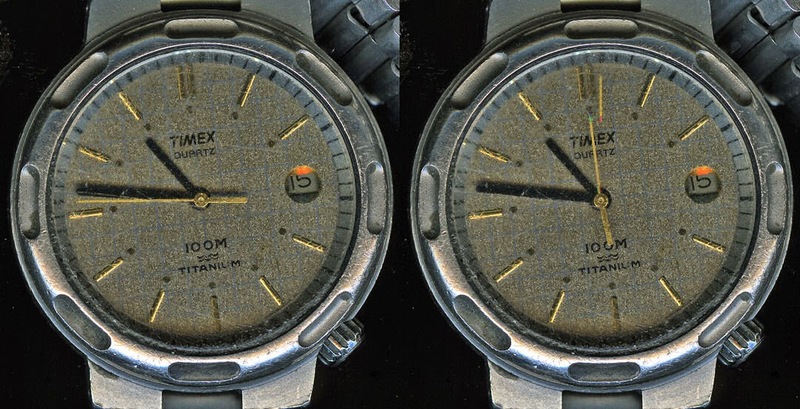 The shock of every one of those moments appears to me to be similar in nature to that of my time-stopping Timex. You see we have our 17 year old granddaughter living with us. You would think that those moments of having teenage daughters (we had two) at home would be receding in our memory and almost (not quite!) becoming more rosy with the forgiveness of time and forgetfulness - but no. We have a teenager in our midst and every moment is loud and clear (like the accidental scratching of chalk on a blackboard). Every moment somehow brings with it an echo. Can time have an echo? Can time, present time, be extended in the same way as sound carries across the North Rim of the Grand Canyon? If that were true, as we physically age with the tension of having our old-age routine suddenly turned up-side down, we just might experience the pleasures of an extended, almost youthful present.